Data from hundreds of small, exquisitely preserved feathered coelurosaurs and early birds from the Early Cretaceous Jehol Group, Liaoning Province, China, suggest that avian flight probably began in the trees (arboreal or trees-down theory) rather than on the ground (cursorial or ground-up theory). The quality of preservation of the Jehol biota and the sediment in which they were preserved accords with recurrent mass mortality events, the animals being asphyxiated, buried by ash falls and swiftly preserved. The inferred palaeoecology of the Jehol biota indicates they lived in a forest environment bordering a large lake. New information on the origin of flight by the Jehol fossils is presented; it includes various transitional stages of flight—from wingless, tree climbing coelurosaurs to parachuting, to gliding, to fully winged, active flying birds. The fossils show development of adaptations necessary to enable wing-assisted climbing: highly recurved claws on hands and feet; long fingers, wrist joints that swivelled, and stiffened tails. Several feathered paravian coelurosaurs, exemplified by Epidendrosaurus, Epidexipteryx, and Scansoriopteryx with wings suitable for climbing, became arboreal, yet were flightless. Their arboreal lifestyles contradict arguments previously advanced supporting the cursorial (ground-up) theory of the origin avian flight. The cursorial model fails to explain climbing adaptations of protobirds, different stages of flight, and development of neurosensory specializations in early birds. Rather, the climbing adaptations of protobirds support an arboreal setting for the evolution of flight. These adaptations include, for example, different stages of flight from a perch, gradual brain enlargement for three-dimensional orientation, acquisition of vision and acute sight, and neurosensory specialization for hearing and balance. We have identified six evolutionary stages of avian flight represented by phylogeny and transitional fossils—arboreal leaping, parachuting, biplane gliding, monoplane gliding, undulating flight, and manoeuvring flapping flight. Arboreal life is suggested to have promoted enlargement of the brain, increased visual acuity, and development of more sophisticated vision. A computer model to simulate the flight performance of protobirds and early birds has been developed that corroborates the argument for the above evolutionary pathway. We thank John Talent for inviting us to contribute to this volume and many Chinese colleagues, especially Zhonghe Zhou, Xing Xu, and Fucheng Zhang, for demonstrating the Liaoning fossil locality to us, allowing us to examine some of the spectacular feathered coelurosaurs, for sharing their ideas with us, and providing us with excellent photos and drawings. Phil Currie, Bill Mueller and other colleagues reviewed earlier versions of the manuscript. 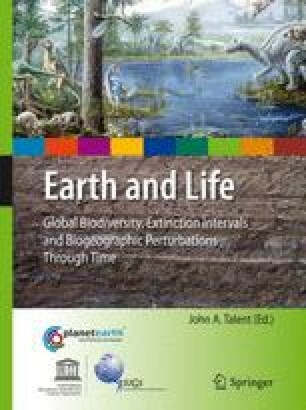 Ruth Mawson, Peter Cockle, Robyn Izberg, Colin McKenzie, Janine Miller, Karen Monk, and Trevor Worthy kindly improved the manuscript. Kyle McQuilkin, Mike Nickell, and Jeff Martz produced the illustrations. Our research was supported by Texas Tech University.